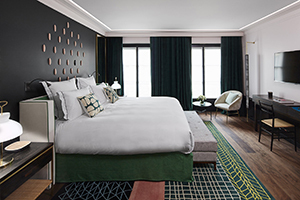 Le Roch Hotel & Spa is located in Paris’ 1st arrondissement and possesses an atmosphere so inviting and welcoming, guests may feel as though it is their own home. 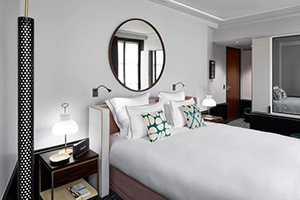 The hotel and accommodations are beautifully decorated by famous French designer Sarah Lavoine with designer furniture, natural materials, and bright colors, complimenting the natural lighting. 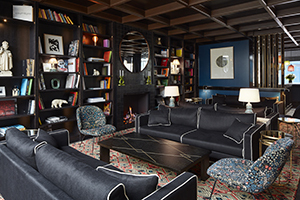 In addition to the spacious accommodations, guests can dine at the gourmet restaurant, relax and sip a cocktail on the unique terrace, visit the Spa by CODAGE, or venture out in Paris with the help of their concierge. 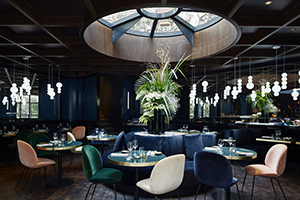 Unique location in the heart of Paris’ culture, fashion, and gastronomic district. 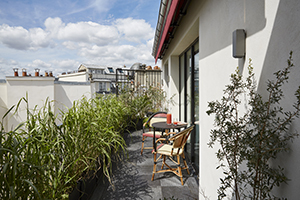 The Saint-Roch rooftop Suite with its own private terrace adjoins to a Deluxe Indulgence Room to become a charming Parisian apartment taking up the entire 6th floor. The restaurant is overseen by Executive Chef Rémy Bererd, with its terrace and indoor garden. 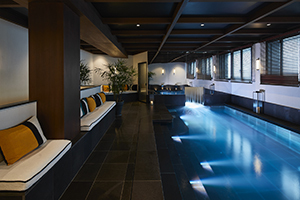 Spa by Codage, a French brand offering made-to-measure skin care, and indoor pool. Youngest Clefs d’Or Concierge in the world. 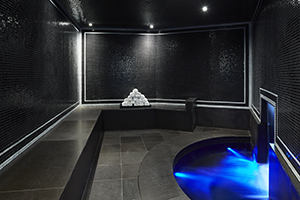 32 elegant and spacious rooms; 4 Indulgence Suites all equipped with a private hammam steam bath, and the Saint-Roch Rooftop Suite. 1 restaurant and bar offering delectable dishes and original cocktails. Private terrace is a lush haven nestled between the hotel walls and the bay window, open to the sky. Spa by Codage offers massages, beauty treatments, manicure, pedicure, hairstylist; also available in the comfort of your room or suite. Indoor swimming pool and hammam with natural daylight. Head Concierge, Benjamin, the youngest Clefs d’Or concierge in the world, will be happy to share his tips for discovering the famous monuments and museums of the capital, as well as its hidden treasures and lesser-known attractions that are close nearby. Multi-service interactive tablet connected to the TV and ability to live chat with the concierges available in accommodations.